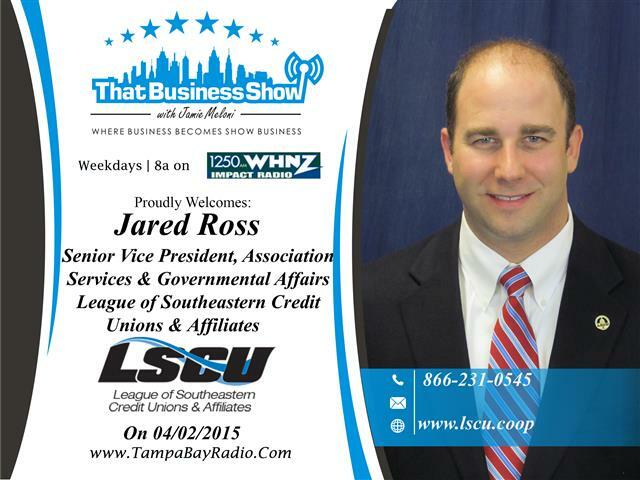 Today on That Business Show, I spoke with Jared Ross to open the show. Jared is with the League of Southeastern Credit Unions and lobbies on their behalf for changes needed within the Credit Union industry. In his role as Senior Vice President, Jared oversees all the League’s advocacy efforts in Alabama and Florida. We spoke of the League’s efforts that are being addressed during the 2015 Legislative Session including their #1 priority which is public depository choice. Public offices in Florida currently do not have the option of using their local credit unions as depositories and are required to use larger national banks. This directs resources outside our communities which could otherwise be used as funding to support local operations and is on the forefront of the League’s agenda this Legislative Session. Jared also discussed issues surrounding patent trolls that are disrupting the credit unions by burdening them with unfair legal costs which lead to increased consumer costs on the backside. We also touched on the importance of financial literacy in our public education system, another priority for the League as they are trying to get a class on financial education to be part of the public educational system for our high school students. Please visit http://www.lscu.coop for more information on the efforts of the League of Southeastern Credit Unions. The 2nd guest on the show was Nancy Crane, Executive Director with the Pediatric Cancer Foundation. The Pediatric Cancer Foundation is a non-profit organization dedicated to funding research to eliminate childhood cancer and to bring non-toxic, more targeted therapies to the marketplace for our children. Through the Sunshine Project, which is a collaborative effort involving the Foundation and 14 hospitals, Nancy and the Foundation have helped raise over $1,000,000 dollars in 2013-2014 alone and the Foundation was recently ranked a top 10 Charity Worth Watching by Charity Navigator. 90% of the funds raised by the Foundation are spent directly on program services which is primarily their research. You can help support this organization by visiting http://www.fastercure.org and seeing their events including the next one coming up – Cut for a Cure and more information on that can be found here – http://fastercure.org/events/cutforacure/cut-for-a-cure.html or reach Nancy directly at 813-269-0955 or email at ncrane@fastercure.org. Lastly but definitely not least was The Remodeler’s Corner, a weekly feature with Yeager and Company, a third generation remodeling and flooring company based in Odessa, Florida. Representing Yeager and Company today was the always entertaining and energetic Charlie the Plumber who was in studio to talk about Jim Yeager’s latest initiative, PI to PI. PI-PI stands for Paris Island to Private Industry and Jim Yeager is looking for both employers and Marines to get involved. 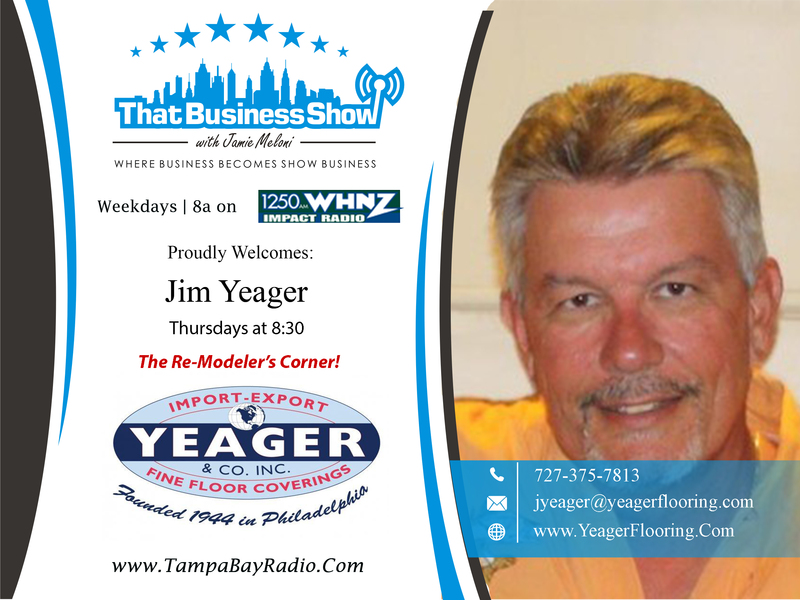 To get more information on this contact 727-375-0206 and you can reach out to Jim Yeager directly at jyeager@yeagerflooring.com and be sure to visit their website www.yeagerflooring.com for all your flooring and remodeling needs!